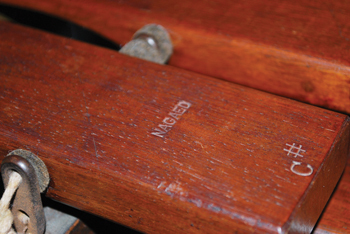 Marketed as the Deagan instrument having the “largest range of any Marimba or Xylophone type instrument,” the marimba-xylophone was available in several models ranging in size from a petite 2 1/2 octaves to a monstrous 6-octave instrument, which allowed several players to perform on a single instrument. At first, it was manufactured with two distinct sized bars, either 1 5/8 x 5/8 inches or 2 x 5/16 inches, but later it was designed with graduated bars. 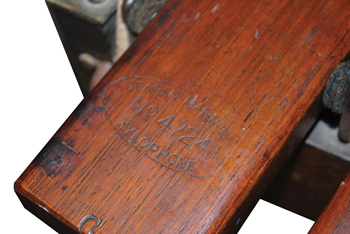 This instrument, Model 4724, was manufactured ca. 1925 and has a range of four octaves, C3 to C7. The smallest bar measures 7 1/4 x 1 1/2 x 3/4 inches and the largest bar measures 17 1/4 x 2 1/4 x 1 inches. The frame is 69 1/2 inches long, 29 3/4 inches at its widest end, and stands 34 1/2 inches in height. 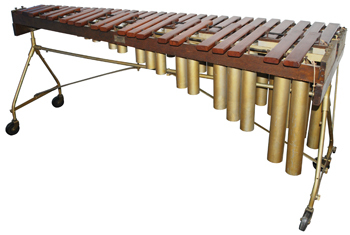 The instrument has patented, tunable resonatorsThe metal pipes that extend below the bars on a marimba, xylophone, or vibraphone. They carry t... with a frame made of quarter-sawed oak. Its lightweight, tubular floor rackA metal assembly that surrounds the drum set and holds the top parts of cymbal stands as well a... is designed for quick assembly and ease of transportation. 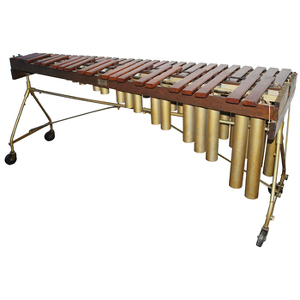 Originally nickel plated, both the floor rack and resonators have been painted gold. Deagan Catalogue “G” (ca. 1918) shows a list price of $310.00 for this model.